While it’s a tiny sample, there may be some value in comparing the Congaree photos with the work on two heavily scaled sweet gums in the Project Coyote search area. Correction: the tree in the second image is a hickory. While it was not possible to examine this scaling up close, the bark appears to be tightly adhering on both trees, and the decay state is likely comparable to the Congaree sweet gum. The work in both cases is on the boles, and the size of the trees involved seems to be roughly comparable. Beyond that, the scaling is dramatically different in a number of ways. Most obviously, the suspected IBWO work from our search area is far more extensive than the PIWO work from Congaree (I suspect the small patches of scaling in the lower photo are the work of a Hairy Woodpecker). As I’ve discussed, PIWOs are not well-suited to scaling bark, anatomically, and it’s not a preferred or efficient feeding strategy – accounting for 23% of observed foraging behavior in Tanner and 7% in Patricia Newell’s more recent and PIWO-focused study. The most significant difference though is in the appearance of the edges. When Pileated Woodpeckers scale tight-barked hardwoods, they typically remove the bark in layers, as in these images. This layered scaling is also very apparent in the photos from Congaree, and it’s absent from our sweet gums as well as from the extensively scaled oaks and hickories that we found in 2013-2014. Our trees show very extensive scaling with no indication that bark has been removed in stages; the edges are clean and incised and very large areas have been stripped, down to the sapwood. 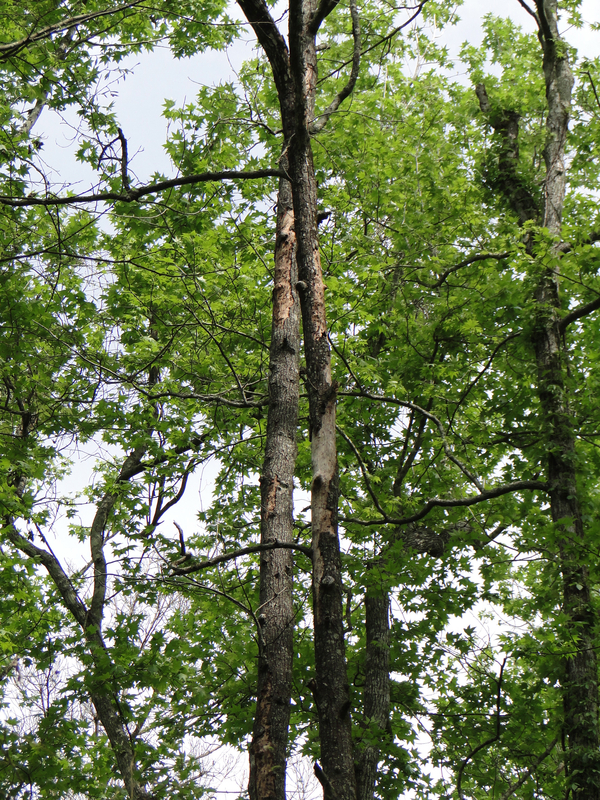 If Pileated Woodpeckers were the cause, it would be reasonable to expect that there would be some sign of layering, especially given the surface area involved, which far exceeds that shown in the Congaree photos or any others I know of (on hardwoods) from the Cornell searches. The high branch work from Texas is intriguing, but the resolution of the images is insufficient to determine whether this clean scaling or whether there’s some excavation, especially on the lower portions. In addition the work is not nearly as extensive as some of the high branch work we’ve found. Edited to add: I’m more intrigued by extensive work below the crown, as in these images. One tree (in the third photo is), definitely a sweet gum is from the old search area. The other tree, which I believe is an oak, is within a hundred yards of where I recorded kent-like calls in 2013, although the photos were taken a year before. There are several other images of sweet gum scaling from Congaree in this report from the mobile search team, but this work does not involve the removal of bark from large contiguous sections of trunk, and the resolution is not sufficient to tell whether the bark has been removed in stages, although it appears to be in at least one of the four photographs. If I were to find it, I would assess this work as being mildly interesting but would not get excited about it in the absence of other indicators. I think scaling on pines, even live ones, is physically possible for a pileated, although the bark will often show signs of having been removed in layers, meaning the edges will not appear as clean. Nonetheless, I do not think there’s a way of reliably determining what species has scaled a pine in the absence of a direct observation and suspect that even HAWOs and RBWOs can scale extensively even on recently dead pines. For the work that I think is diagnostic, the species that I think are most reliable are oaks, sweet gums, and hickories. I think that the distinction is an easy one to make once you’ve seen the work firsthand. In the old Project Coyote search area, we had persimmons, hackberrries, and honey locusts that had very suggestive scaling and lots of it. But the bark on honey locusts tends to loosen early in the decay process. Hackberry bark fractures, and while persimmon bark is thick and tight, it tends to loosen when the wood is still very hard. These qualities complicate the analysis, though I’m confident some of that work was done by IBWOs. 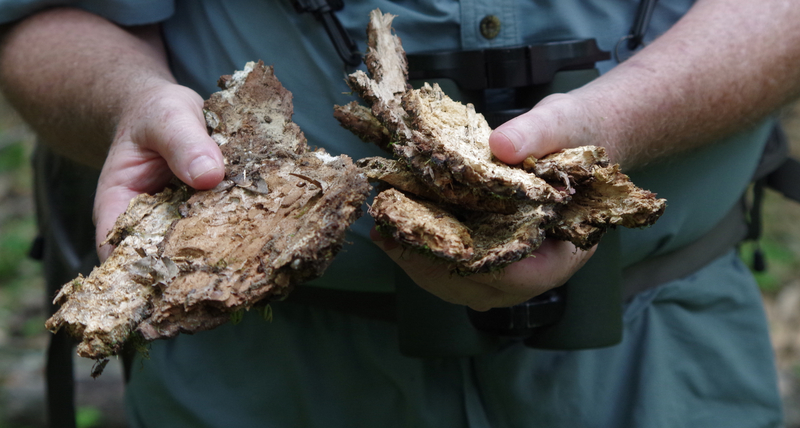 There was a vast difference between the size of bark chips from known PIWO foraging on honey locusts and suspected IBWO foraging on the same species. Extensiveness and quantity (concentrations) are important to look for too, especially when there are a lot of pines or an abundance of more easily scaled hardwoods. For this analysis, I include looking at high branch work but otherwise don’t ascribe a great deal of importance to “Tanneresque” sign, unless there’s a lot of it, and it’s associated with what I think is diagnostic. I am not suggesting that this is the only way that Ivory-billed Woodpeckers forage. There may be seasonal and regional variations, but I suspect that some of this type of work will be present in any area where IBWOs are resident. It’s not necessarily easy to find. I agree with Fangsheath, from ibwo.net, that the failure to do so should not be treated as evidence of absence, but I’m convinced that finding this very specific type of work is compelling evidence that IBWOs are present.